This was my first attempt at any kind of enchiladas, and I have to say it was a good one. They aren’t quite traditional because they’re stacked instead of rolled, but they manage to hold in all the spice and flavour (plus the fried egg on top works really well). I adapted this recipe from Food 52 and it was a big hit in my house. I used a sunny-side up egg on one and left the top of the other just with cheese; they were both really good. 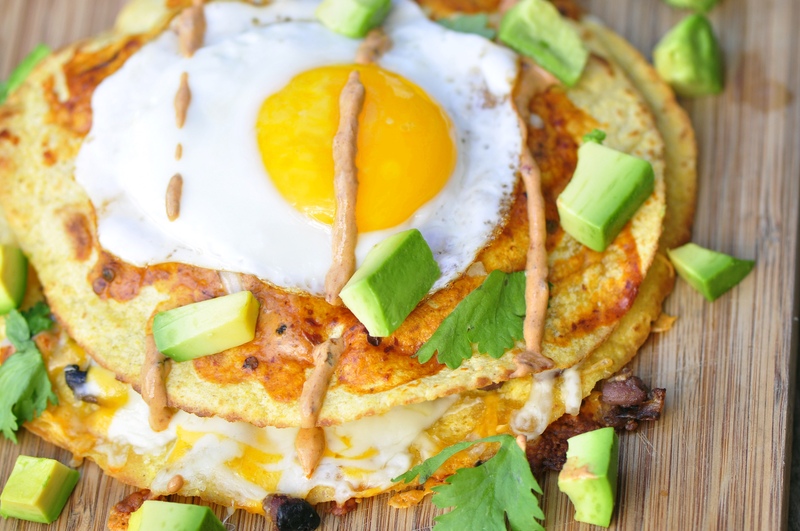 The egg isn’t needed but if you like a bit of a runny yolk or some extra protein, it’s a great additive. It also just looks cool. I used a can that said “whole chipotle peppers” instead of it actually saying adobo, but if the peppers are soaking in a mixture that generally consists of tomato puree, spices and vinegar that is the right ingredient. The chipotle sauce can pack quite a bit of heat so if you’re not as much of a spicy food fan, you can tone down the heat by taking out some of the seeds from the peppers in advance. In a small food processor, blend chipotle peppers (including sauce from can) and greek yogurt until completely smooth and there are no major chunks. Add water and process for another 60 seconds. Set aside. Heat 1 tsp. of vegetable oil on a medium pan and throw in onion, beans, mushrooms and seitan. Cook for 6-8 minutes until softened and browned. In the meantime, heat the remaining oil in another pan. 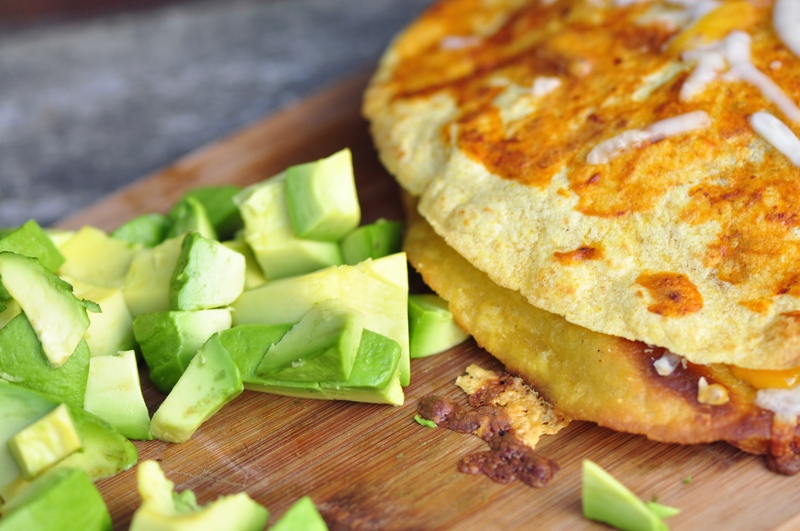 Fry 1 tortilla at a time, about 60 seconds per side until they puff slightly and edges crisp. Repeat until all 6 are cooked. In the same pan used for tortillas, cook the eggs “sunny-side up” style so that the yolk is runny and the whites are cooked through. Leave on low heat to keep warm, but careful not to overcook the middle. Place one tortilla on an ungreased baking sheet. Spread a thin layer of chipotle sauce, then sprinkle a thin layer of both cheeses. Spoon a small amount of vegetable/seitan mixture on top, add a little bit of fresh cilantro, and place another tortilla on top. Do the same for the next layer. Once third tortilla is placed on top, spread a very thin layer of chipotle sauce and sprinkle a small amount of cheese. Repeat this process for the next 3 tortillas and remaining ingredients. You should have 2 stacked enchiladas with 3 layers. Bake enchiladas in oven for 5 minutes until the cheese on top has slightly crisped and melted. 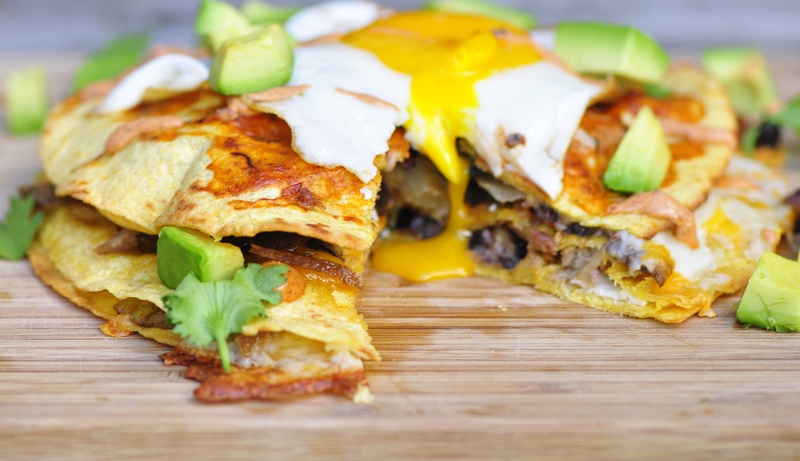 Remove from oven and place a sunny-side up egg on each of the individual enchiladas. Drizzle a small amount of chipotle sauce on top of each egg. Scatter enchiladas with avocado and cilantro—serve immediately. This is making me so hungry! 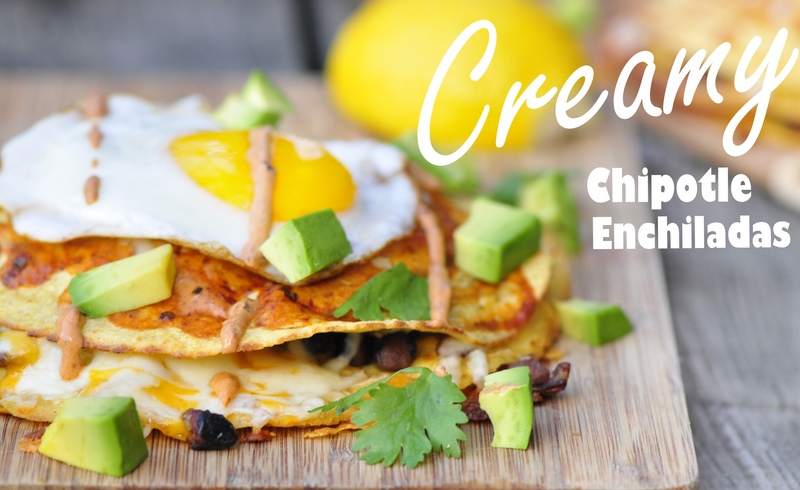 Creamy chipotle enchiladas? YUM and I love that fried egg on top. Delicious!